This week's final pre-season test is crucial for the Formula 1 teams as they prepare for the start of the season in Australia in just over two weeks' time. It will be their last chance to learn about their new cars before the race in Melbourne on 15-17 March - and an opportunity to fit the upgrades that will give them a step forward in performance for the first grand prix. It is also a final chance for those of us watching to try to work out the competitive order. The first two tests have given a confusing picture, not least because of high tyre wear, but after analysing the lap times extensively I believe some things have become established. Let's run through where I believe the teams stand ahead of events at Barcelona's Circuit de Catalunya from Thursday to Sunday. The world champions' form is hard to read. Red Bull's headline lap times have not been that impressive - world champion Sebastian Vettel was fifth fastest overall in Barcelona last week - and he has not done a proper race-simulation run that corresponds with his low-fuel times. Normally, you can get a sense of a car's pace by comparing the headline lap time with those done at the start of a race-simulation run. There should be about seven seconds between the two, so if there isn't it either means the quick time was done with more fuel on board than was necessary or the race run was not representative in some way. So Red Bull confuse me a little at the moment. Obviously, they will be quick - but the question is how quick? I don't think they are as happy with where they are as they need to be. They will have some developments at this week's test and that is going to be important for them. Fernando Alonso did all the dry-weather driving for Ferrari at the second test and he was genuinely quick. He was second fastest overall, 0.027 seconds behind McLaren's Sergio Perez, but given he did his time on a longer run than Perez you know that the Ferrari could have gone faster. If you take into account the length of the run, and fuel-correct the lap time for the minimum amount of fuel on board to allow the car to run that long, you get a figure for the speed the car could have gone. The car may have had even more fuel on board than that, but you know it could have gone at least that fast. Fuel-correcting Alonso's lap gives him a time 0.258secs quicker than Perez's best. That's a pretty good lap. I do a lot of analysis of where teams are based on their fastest lap times, and it's clear that Ferrari look as though they have stepped forward from the end of last season. That's a good achievement because with the new restrictions on the use of the DRS overtaking aid, the cars should be at best the same as they were, given the improvements inevitably made from year to year, or perhaps a bit slower. In fact, nearly every other team has either stayed the same or gone backwards. Only Lotus and Toro Rosso have definitely matched Ferrari in making the car faster than it was last year. I would say Ferrari are looking OK at the moment. Of all the teams, Lotus have probably made the biggest step forward from the end of last year to the beginning of this. They ran a very sensible programme at the second test - they did low-fuel runs, set-up, race-simulation runs. Not trying to confuse anyone - or, more importantly, themselves. Kimi Raikkonen had some reliability problems but Romain Grosjean had a good, solid time and the upshot is the car is clearly in good shape. It looks better than last year's car and it's consistent. They've had a few reliability problems but better to get them out of the way in testing than to have them at a race weekend. As with Grosjean, you can run through the programme of McLaren's new recruit Sergio Perez and see he had a good, sensible second test, doing what he needed to do to work out where he and the car are and how each can be improved. His fastest time was strong, too. The same cannot be said for his team-mate Jenson Button. His comments after driving the car, that the team were finding it hard to understand the car, are very typical of him. That's the job - to get the car to work consistently. Anyone can make the car difficult to understand; the job is to set the car up so that it gives you what you need, and then you go forward. The evidence so far is that Perez could be a dark horse this season. He himself says he wants to win the championship. I'm not saying that's going to happen, but judging from testing so far he is going the right way about it. Although Lewis Hamilton has been downplaying Mercedes' prospects, the car looks pretty good. Hamilton set the ninth fastest lap time overall at the test, but it was less than a second slower than Perez's best lap, was set on hard tyres - which are about a second slower than the softs that Perez used - and came at the start of an eight-lap run. That makes Hamilton's lap pretty fast. And the same goes for Hamilton's team-mate Nico Rosberg, whose fuel-corrected time was the fastest of the test - marginally faster than Alonso even. The problem is that, as with Ferrari and Vettel, there is no way of cross-correlating Rosberg's time with a high-fuel run so you don't know how much fuel he had in when he set his fastest time - and without that knowledge you're just guessing. 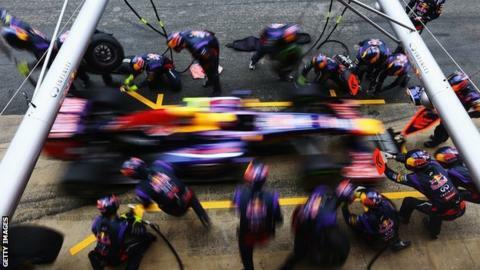 You could be 10, 20 or 30kg out - and 10kg of fuel is 0.38secs a lap at Barcelona. Force India finished last season on a high with a series of strong performances from Nico Hulkenberg, who has since joined Sauber. It looked from the first test in Jerez that they had continued at that level, but they didn't appear to perform as well at the Barcelona test. I suspect they are not doing themselves any favours by not having decided on a second driver to partner Paul di Resta. They're messing about and they are not a team who should be. They had development driver James Rossiter in it at Jerez, and in Barcelona they used both their former driver Adrian Sutil and reserve driver Jules Bianchi. That can't be helping - it will mean they're going backwards not forwards. They need to get their driver in. They know Sutil will do a solid job but I would choose Bianchi. He's quick; he did the lap time in Jerez to show that; and I'm sure there is money in it from Ferrari for them as he's in their development programme. Sutil will do OK, but he was no better than Di Resta when they were team-mates in 2011, and that was Di Resta's rookie season, so he'll have come on a bit. Williams were the only team to wait until the second test to introduce their new car and it went well. It seems to have moved them forward. But it's difficult to be sure where they could have been last year because they were let down by both their drivers so often. The new car looks tidy and effective in all the right areas - front wing, brake ducts, rear end etc. Hulkenberg did a decent lap time in the Sauber but when you look at what Ferrari and Mercedes could have done it was at least 0.7secs off the pace. That's a long way. But at least they know where they are. Toro Rosso look to have made a step forward, but they needed to - they were at the back of the main bunch. I think they have now made a step into that group. Finally, I'm afraid Marussia and Caterham are still adrift at the back of the grid. In fact, they have lost ground to the front-runners rather than gained it.